Art has got no limits and boundaries; it goes beyond all the restrictions and makes its own way. 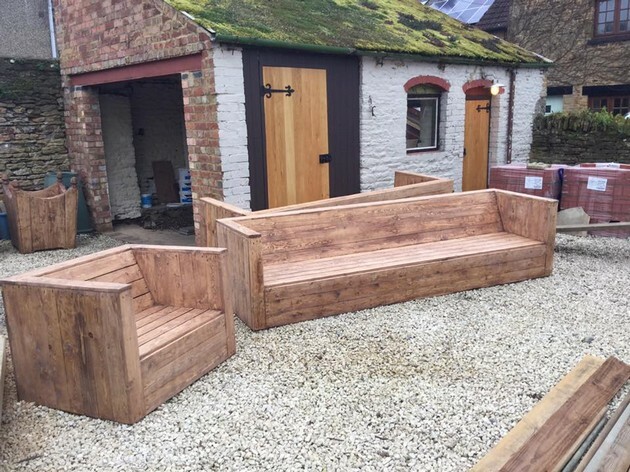 Just like all other forms of art, wooden pallet recycling is also a distinguished form of art in which we make certain furniture items for our house hold and sometimes for our commercial sites. We also apply the wood pallet in several garden décor ideas. In fact this form of art is applied in every aspect of life by our smart pallet wood crafters. Articles made with the wooden pallet are not that sort of regular stuff, but they reflect a certain flavor of art and aesthetic. A wood pallet repurposed wall shelf is undoubtedly need of every household. It has got several purposed to serve. Sometimes it is used as a mere display hub of your favorite decoration pieces and some times it also works as a smart storage hack. As we discussed earlier that we also use the pallet wood in some commercial articles. 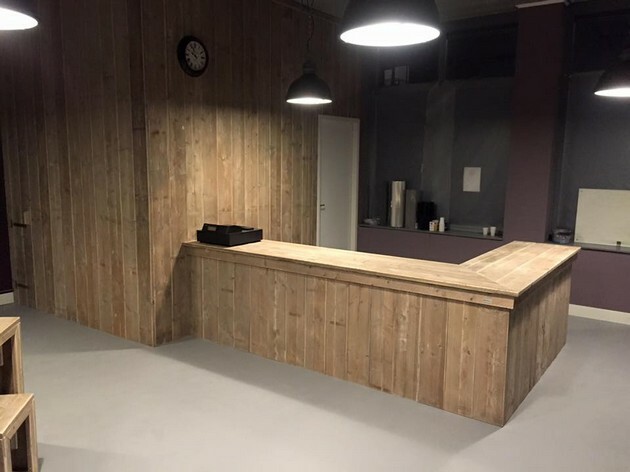 Same is displayed here where we have made a large wooden pallet recycled desk that would be used by the front desk officer to perform certain duties. We just had to be pretty cautious in the selection of shipping pallets. Just a few moments back, we talked about the storage hack. Just for the sake of information, why a proper storage hack is needed? 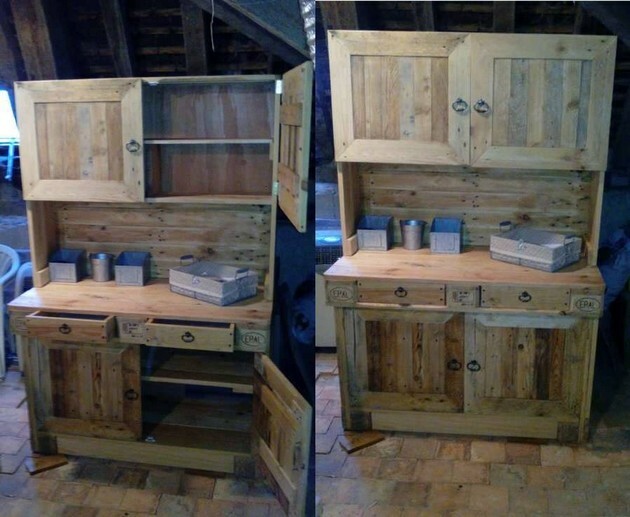 In the urban settings where we have been confined to mere square feet, in this situation we have to resort to such smart storage hacks and this wood pallet cabinet is a good source. 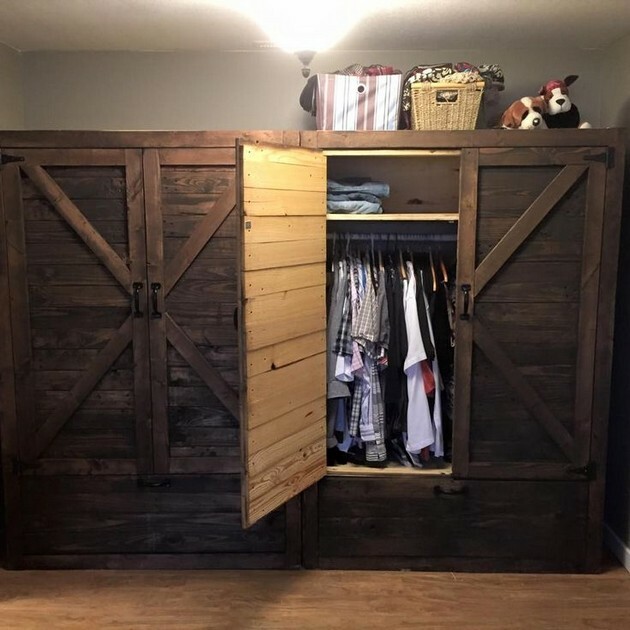 Now again a suiting closet is something that can not be denied in a common household. All of us need it. Purchasing these wooden items from the market is just like a menace, but the wood pallet recycling has turned it into a blessing to make some furniture items for yourself. How does a comprehensive outdoor sitting plan look like? Well. If you ask me this question, I would refer you straight away towards this pallet wood repurposed outdoor bench and the good thing about this is that it has got a proper shade. 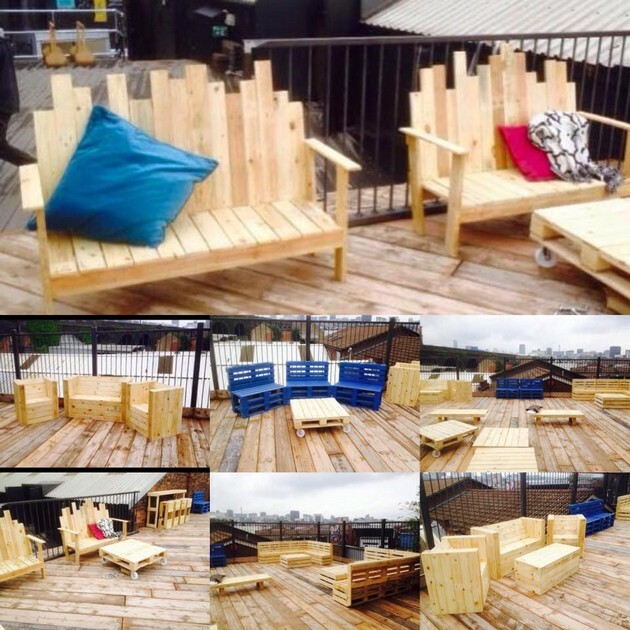 Wood pallet recycled outdoor furniture has remained in our focus. We have made countless wooden pallet furniture items for indoor and outdoor as well. 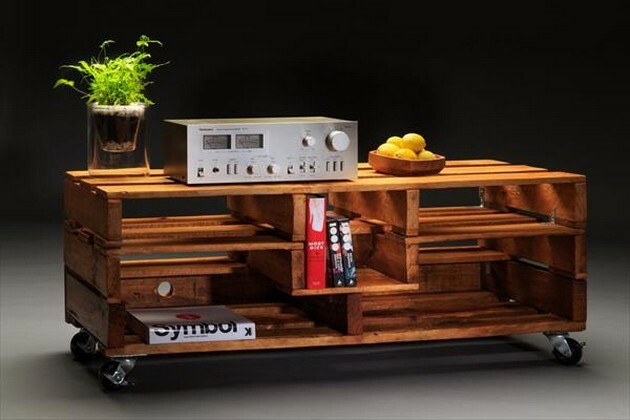 There are many potential benefits of the wood pallet recycled furniture like it is economical, durable and long lasting. A vertical wood pallet garden is another famous pallet wood creation that we have recycled in a large number. There were so many reasons behind it. 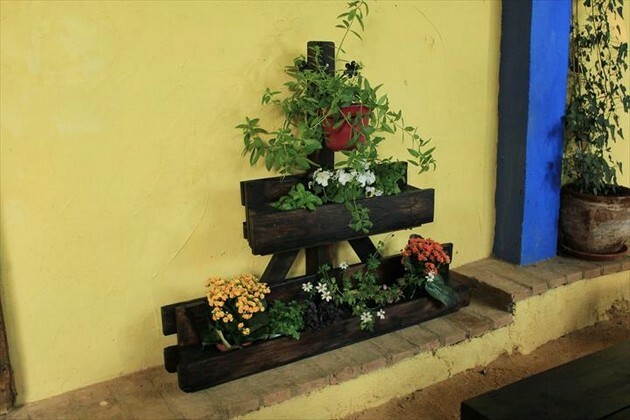 This is perfect substitute of a green landscape, plus it is economical, it can be used to plant certain herbs so this is an ideal pallet wood creation. Ok, whenever it comes to a wooden coffee table, I really become super excited because this is one of my favorite pallet wood creations. I have recycled a large number of wooden pallet upcycled coffee tables, here is another with a beautiful design along with ample built in space right below the table top. 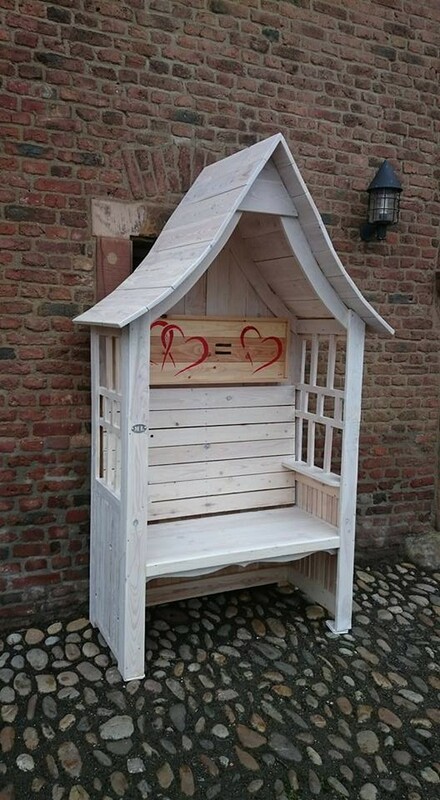 You just have to be generous to comment about all of these wood pallet outdoor creations. 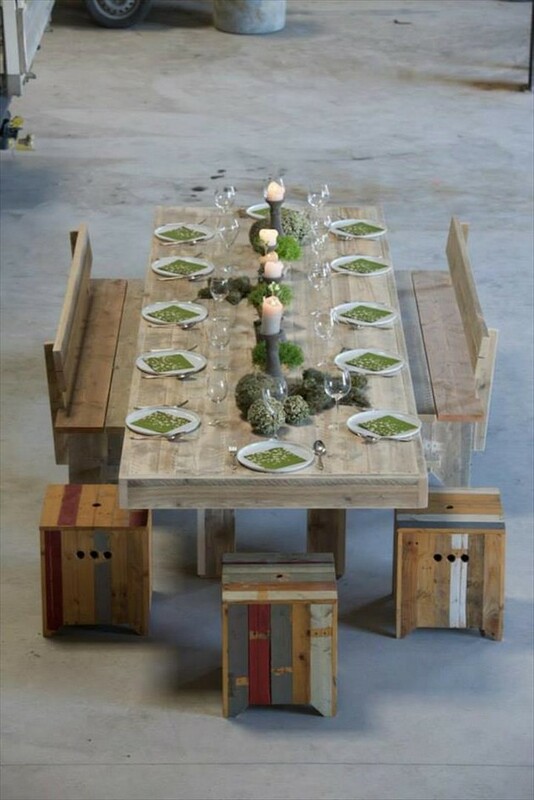 They are such a fine example of wooden pallet repurposed outdoor furniture. They have got everything, style, charm and above all they are economical. And now comes a wood pallet recycled room bed, that is certainly needed in every house hold. 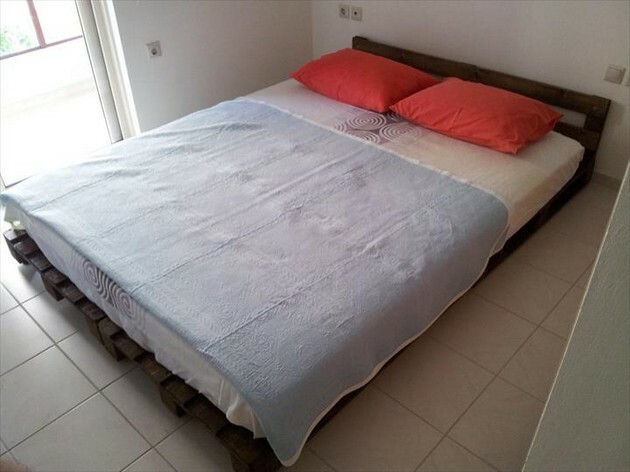 A room isn’t complete without a proper room bed, so just hurry up and draw your feasibility for making this pallet wood recycled room bed. We have just used some raw and plain shipping whole pallets here. 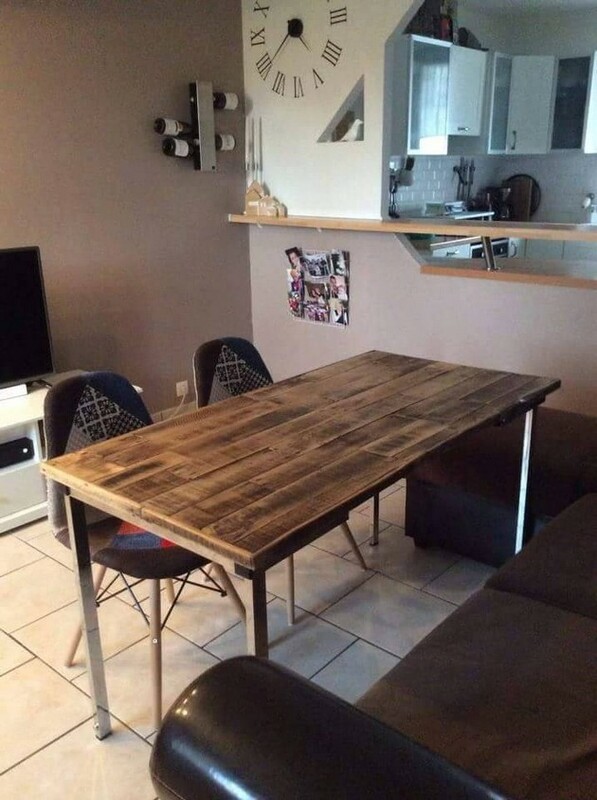 What would you say about this pallet wood made table? Made with reclaimed metallic legs, the table top is again made with the same shipping wood pallet planks. The main difference is the quality of the shipping pallets that we have used in here. 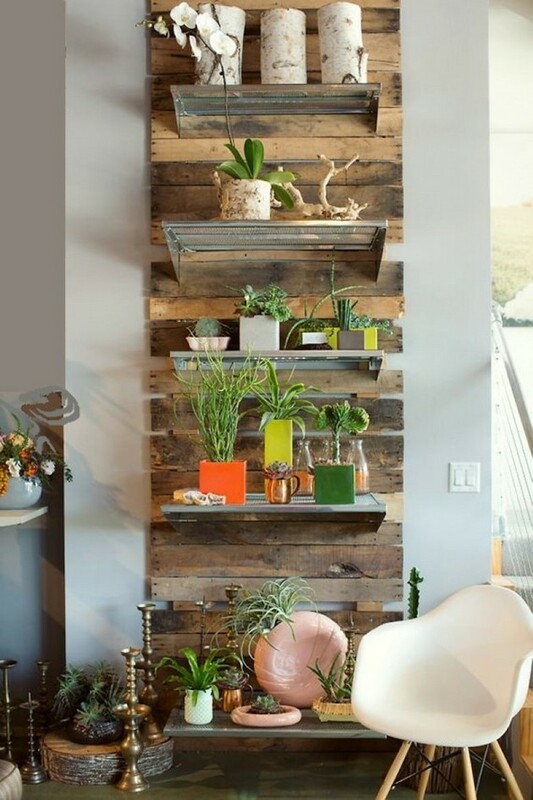 As we said earlier that a vertical wood pallet garden has got so many potential benefits, and at the same time it is a perfect decoration piece as well. This looks pretty great while kept in the lounge or in the porch. 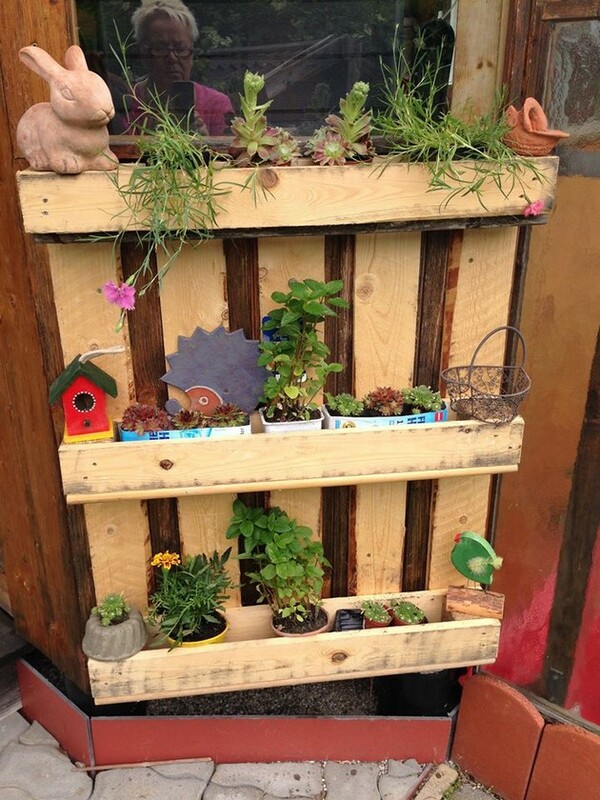 Despite of the deteriorated pallets used here, this still makes an ideal wood pallet vertical garden. 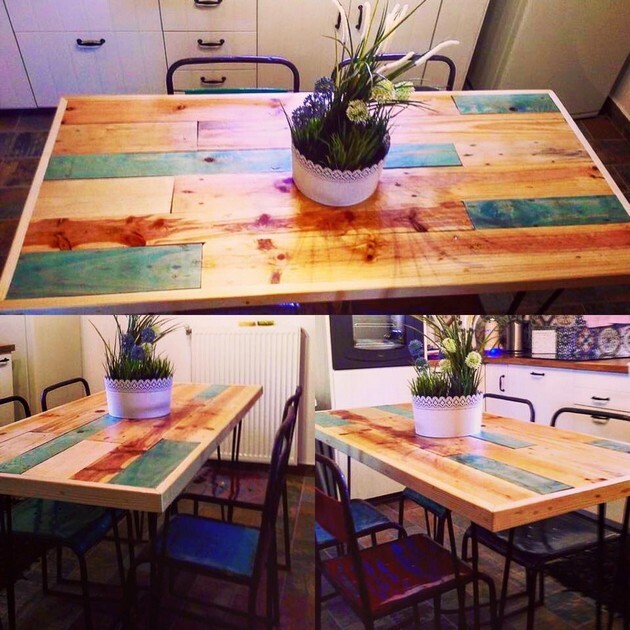 Here is another wood pallet recycled dining table with reclaimed metallic legs. We could have made the entire frame using the same timber that is pallet wood, these metallic reclaimed legs are used just to give it an industrial touch and it really worked. 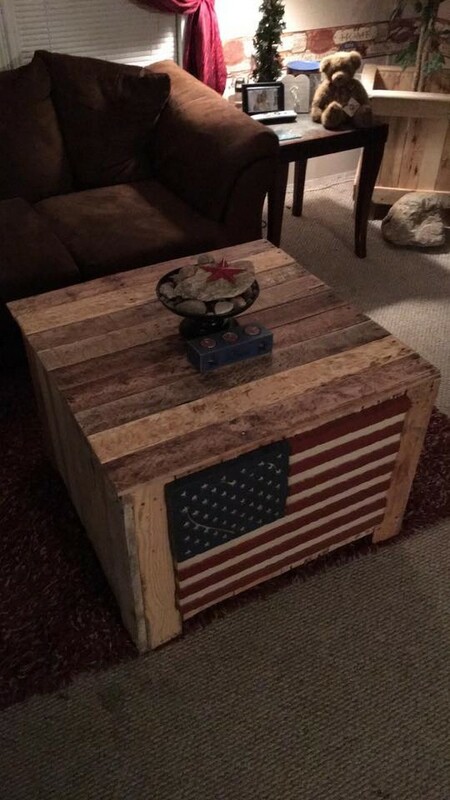 Now this is something different, apart from the different design and structure that is pursued in this specific wooden pallet table, it has also got the national flag of United States Of America. This shows a crazy affiliation and love for the motherland. This is a loud depiction of the patriotism, so this one is dedicated to the marines of US army. 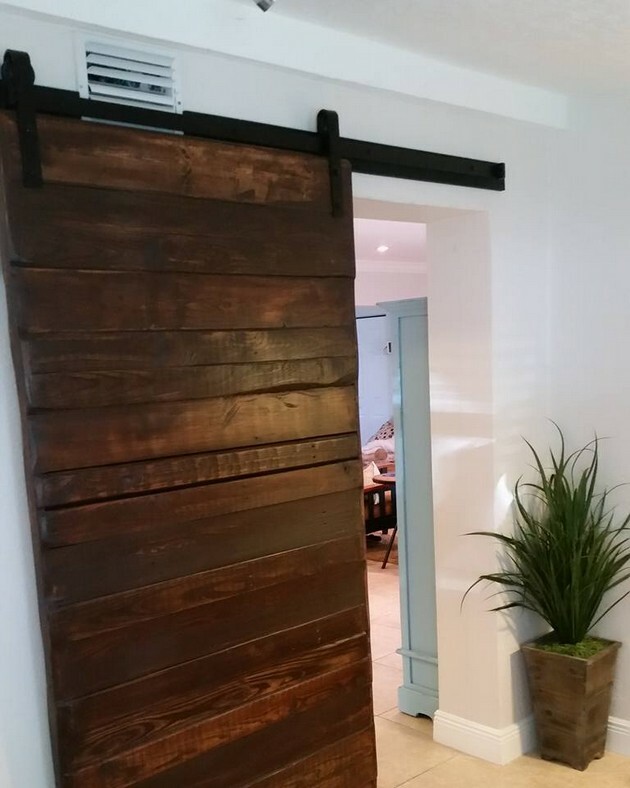 The next one could be a bit confusing for many of you, but in general this can be taken as a wooden pallet wall cladding, or a wooden railing door as well. Being specific about the quality of pallets, they are quite broken and deteriorated still they worked. 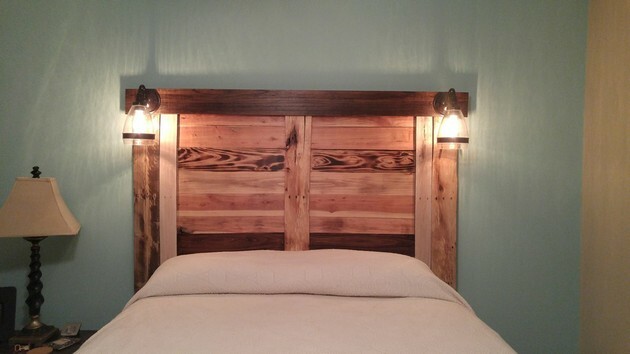 I know if you are a smart wood pallet crafter and you have got the skills and also the supplies, your bed can not be kept without a proper wooden pallet headboard. 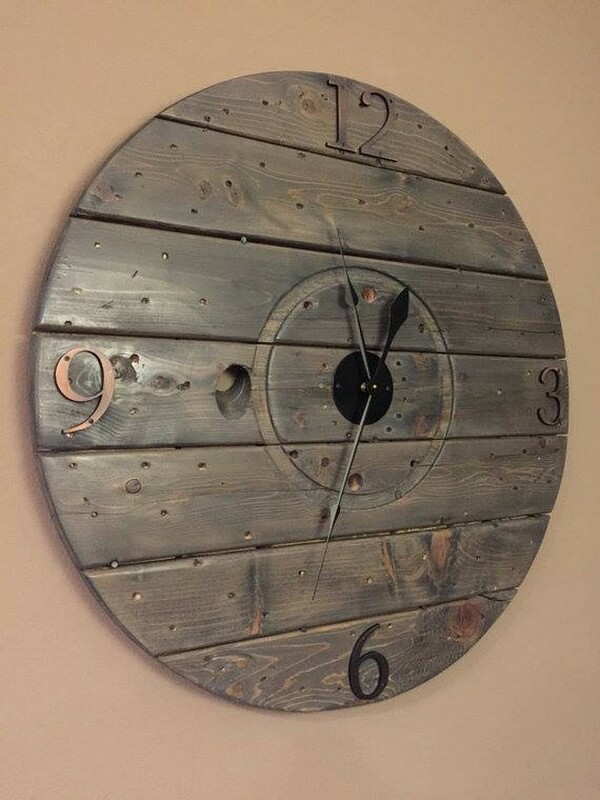 So this is done by some crazy wood pallet crafter. My goodness, did you ever know that this sort of classic and exquisite wood pallet furniture items can also be made with this raw material? If not, then you must ponder upon this splendid wooden pallet repurposed table along with a smart design and ample storage space right inside the wooden table. 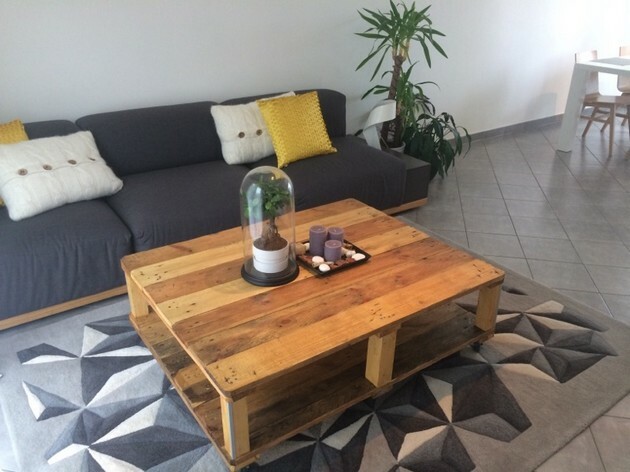 And finally, a classic wood pallet made portable wooden coffee table is displayed here. It has got the smartest design, the table top can be replaced to regain the internal storage space. The glass top is attached with metallic railing. 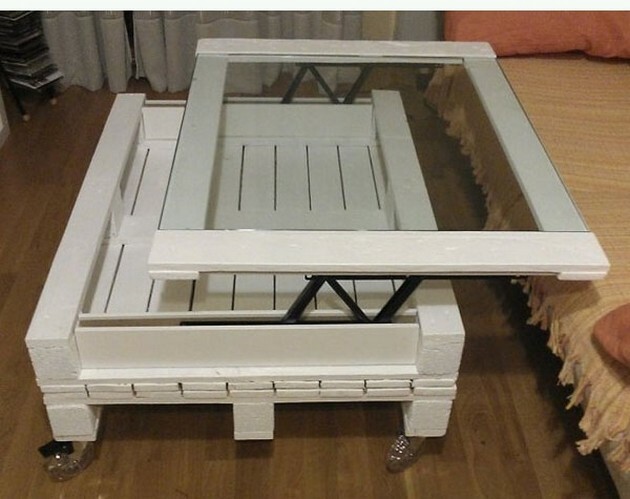 This is an ideal wooden pallet furniture item for your indoor.